This could be my dream house. Seriously. CT Cupcake emailed me a photo of her parents' Cape Cod house. There's even an anchor in the yard! Also my dream home!!! Look at the little lighthouse! Adorable! This house is so fun! Personally, I always thought it would neat to live in an old lighthouse. Let's go visit!! I've never been to Cape Cod but I want to SO bad! Thanks for all the love! Next time I will take pics of the inside. The cape is such a great place! PS in the lighthouse, the bottom floor is an office and the 2nd floor is a reading nook. You can climb up to the light, which does in fact, work! That is like a perfect vacation home! 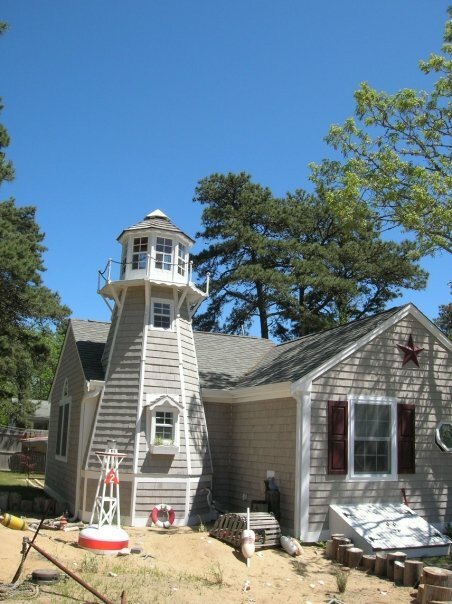 The light house is adorable.